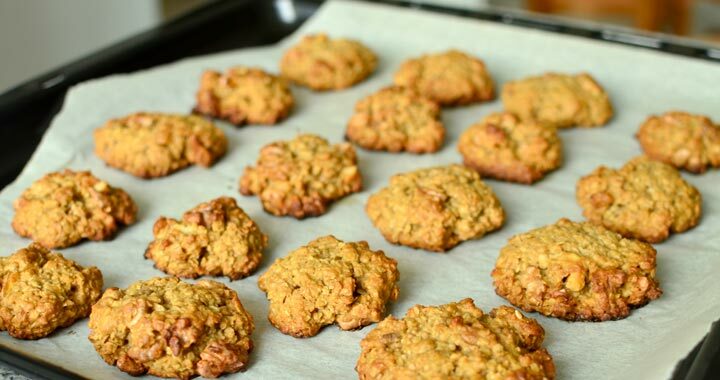 These honey oatmeal cookies are just awesome and so easy to make! They are a chewy load of deliciousness. Better yet they keep super well so you can make a week’s supply of them and bring them to work as a healthy snack or enjoy them for breakfast with your tea or coffee. They are a great source of energy and make a filling snack or breakfast due to the use of oats and whole grain flour (so loaded with fiber!). Have I mentioned that I love these cookies? I LOVE THEM! We usually make a large batch of these oatmeal cookies – twice this recipe – and have them over the week for breakfast or snacks. It really makes things much easier and healthier. When I was working in an office I used to put a few in a sandwich bag and take them with me. My colleges loved them just as much as I did. You can use what ever nuts you prefer, we have a walnut tree that keeps us well supplied year round, so it’s our go to nut, but feel free to use almonds, macadamia, pecans or Brazil nuts – really anything works. 1 cup wholegrain wheat flour (you can make the honey oatmeal cookies also gluten-free by substituting the wholegrain flour for buckwheat flour or gluten-free wholegrain flour). 1 1/2 cups of whole rolled oats. 1 tbsp cinnamon (check out these 11 health benefits of cinnamon). 1/2 cup coconut oil, (if it has turned solid, just warm it up slightly), or olive oil. 1 tbsp black molasses, replace with 1/2 tablespoons honey if you don’t have molasses. 1/2 cup raisins or dried fruits like cherries, chopped dates or chopped apricots, in my experience, raisins are the best. 1/2 cup walnuts or almonds, Brazil walnuts, hazelnuts or any other nuts you prefer. Step 2: Mix the wet ingredients. Step 3: Mix it all up. Combine the wet and dry ingredients along with the nuts and dried fruit of your choice in a large mixing bowl. Step 4: Let it set and come together. Cool he mixture in the fridge for 20 min so the mixture firms up and binds together well. While you wait you can clean up the kitchen mess you made and preheat oven. Step 5: Preheat oven to 170 C or 335 F.
Step 6: Prepare for baking. Line a baking tray with baking paper. Take a tbsp full of the cookie mixture and shape into flattened round (roughly) cookie shapes onto the baking paper. You don’t have to flatten them out much as they will do that naturally as they cook – and you want them a bit thick so they keep moisture in and come out chewy. Step 7: Ready, set, BAKE. Bake the honey oatmeal cookies for 15 – 20 minutes (depends on how thick and big they are). They are ready when they are golden on top and golden brown on the bottom of the cookie. My tip is to bake them for 15 min, take one out, check the color and try. They will get harder and chewier as they cool – keep that in mind! Also, I have had the best experience when placing them in the middle of the oven. We also have other healthy breakfast or snack recipes. Check out our easy buckwheat banana bread recipe. What kind of healthy snacks do you make? I’d love to hear back form you in the comments below. Posted in Baking recipes, Breakfast recipes, Dairy free recipes, Quick and easy recipes, Recipes, Snacks, Vegetarian recipes and tagged baked, breakfast, coconut oil, cookies, healhty cookies, healthy, honey, oatmeal, snack, whole food, whole grain.